Tel Aviv Dog Beach: Amid ongoing investigations for, as far as we can tell, illegally forcing their household help to hide cigars and 30 Agurot deposit bottles inside of furniture while riding on a submarine, reliable sources now declare that the only member of the Netanyahu family not under police investigation is their dog: serial biter/stealth pooper Kaiya Netanyahu. 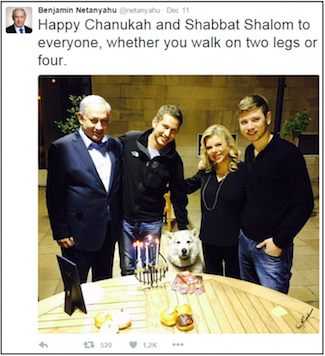 And with the rest of the family in a bit of “deep dog doo doo” Kaiya finds herself the only Netanyahu who has not been interviewed under caution by the police. We had a chance to speak with Kaiya after she finished swimming at the Tel Aviv Dog Beach. UPDATE: Amid ongoing fallout from Yair and Kaiya’s “Poop-Gate” incident last month, police have asked Kaiya for a “sample” to see if there is a DNA match with the “evidence” left behind at the scene. She has now retained legal counsel and is referring all questions to her attorney. The Leftist Americans are trying to pull the same vile tricks with Trump! Phony charges, political libels, lies and threats is all the Israeli and US Left have to offer, it is disgusting.